A uPVC window from Liniar is recognised as the industry-leader uPVC window design. Their innovative and intelligent design has proved itself to offer standards of quality that are unattainable anywhere else, and are the smartest choice for any homeowner. Liniar was established by some of the most forward-thinking and knowledgeable designers in the industry, who totalled more than 500 years of experience between them. Revolving around research, development and design, the Liniar uPVC profile continues to push the boundaries of quality. Consisting completely of British engineering, Liniar uPVC windows only use the highest quality uPVC available. Not only are these uPVC window built to last, they also consist of high levels of inherent security. The quality of uPVC has an inherent robustness and rigidity, that is greatly resilient to force. Internal structures are fitted inside all Liniar uPVC windows in order to allow for integrated reinforcement. Not only does this greatly increase window profile strength, it also means that you won’t need to invest in any costly steel reinforcement. Due to their fantastic design, structural integrity and longevity are assured. All Liniar profiles are accompanied with a 10-year guarantee, which covers you against cracking, warping or discolouration from the date of installation. All Liniar products are built to last. Every uPVC window from Liniar is fitted with the world-class locking system from Yale. These locking systems combine a myriad of features to achieve a level of security that is completely unrivalled in every way. All Liniar uPVC windows are fitted with size-optimised chambers that break up mini-convection currents and trap in pockets of warm air. This results in a greatly reduced level of heat transfer and therefore keeps your heating inside where you pay for it to be. They also feature a unique ‘glazing flipper’ gasket, which greatly reduces cold transfer, water ingress and noise pollution. This not only maintains a high level of thermal efficiency, it also maintains the quality and comfort of your home. All Liniar uPVC windows effortlessly achieve an exceptional WER of A+, which is a fantastic illustration of the standard of thermal efficiency that they achieve. Liniar uPVC windows simply offer more. Modern innovation means that all Liniar uPVC windows feature specially designed profile contours, which maximise natural drainage. This prevents moisture building up on your windows and compromising performance and structural integrity. The unique ‘glazing flipper’ gasket that is present in all Liniar uPVC windows ensures that all windows maintain tight weather seals. This means that your home won’t suffer from leaks, draughts or escaping heat. Liniar uPVC windows cover you throughout and ensure high levels of performance across the board. Liniar Casement Windows are often referred to as the ‘ultimate window’. They are stylish, secure and energy efficient, and have proven themselves to be a classic and practical addition to any and all homes that they are installed in. To ensure performance and longevity throughout, all Liniar Casement Windows contain durable hardware, which has been tested to 20,000 cycles and Stay Guard Elite hinges that can easily withstand twice the force required by Secured by Design testing. A beautiful casement window aesthetic is guaranteed via a simple, sophisticated chamfered rebate that offers a contemporary look. All casement windows also display ultra slim sightlines, which not only allow for a larger area of visible glass, they also provide more light and enhanced views. Offering protection against any would-be intruders and adverse weather, all casement windows are fitted with Yale locking systems and can achieve a WER of A+. Get the best, with a Liniar uPVC window. Liniar Bay and Bow windows are a fantastic way to bring a sense of grandeur to any home, whilst simultaneously enhancing views and space. The beauty of Liniar Bay and Bow Windows is a wonderful way to add character to any home. In order to secure a consistent look, Liniar Bay and Bow windows can be fitted with additional ‘dummy sashes’ in order to create equal sightlines. This not only enhances the look of your home, it also means that you’ll enjoy equal glass area, and therefore increased natural light. Although they are grand in design, Liniar Bay and Bow windows can be fitted with structural bay poles. These can be carried through the cill onto a hidden bearing plate, which in turn allows it to completely support any structural loads. Upholding all exceptional standards that Liniar achieves, Bay and Bow windows offer unbeatable standards of security, thermal efficiency and security. Liniar Flush Sash Windows are an attractive, low maintenance and thermally efficiency alternative to their traditional timber counterpart. They are perfectly designed to replicate the old, whilst giving access to all the benefits of modern innovation. Their beautiful aesthetic is inspired by traditional timber joinery, with the frame and the sash sitting flush when closed. This allows them to fit seamlessly into both period and contemporary properties. Whatever the style, these uPVC Flush Sash Windows are sure to be a beautiful addition. Although they capture the traditional timber look, Flush Sash Windows contain none of the maintenance headaches. Thanks to the innate low maintenance qualities of uPVC, you’ll never need to sand, treat or repaint them. The combination of Liniar’s multi-chambered profile, and the world-class locking system from Yale ensures that a Liniar uPVC Flush Sash Windows is sure to have you fully protected against any attempted break-ins and any adverse weather. Liniar Tilt and Turn Windows are a versatile, attractive and functional option for any homeowner who is looking for a uPVC window that upholds a wonderful aesthetic whilst offering home enhancing multi-functionality. 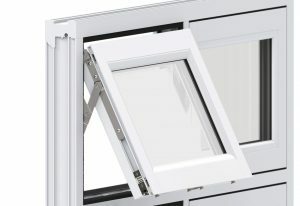 The signature of a tilt and turn window is it’s convenient ‘tilt only’ function, this is a feature that allows for additional ventilation without compromising on security. This means that you can increase airflow without sacrificing the safety of your loved ones. In order to maintain the beautiful European aesthetic that consists of crisp, concise detailing, all hardware that enables the tilt and turn window to operate is concealed. This also greatly increases security, as it eliminates easy access to anything that might compromise structural integrity. Functional, safe and thermally efficient, all Tilt and Turn windows are fitted with Yale locking systems and achieve an exceptional WER of A+. An instant modern classic, Liniar Sliding Sash Windows capture a beautiful traditional look without missing out on all the industry-leading benefits that the Liniar profile brings. They allow any homeowners to maintain a period look, without any of the out-of-date setbacks. Original timber windows were normally heavy and cumbersome to operate, thanks to a contemporary and intelligently designed spring balance mechanism Liniar Sliding Sash Windows are able to offset the weight of the sash, and result in effortless operation. With fitted restrictors, Yale locking systems and a thermally efficient profile, Liniar Sliding Sash Windows offer protection across the board, eliminating the possibly for trapped fingers, break-ins and a cold home in the winter. Liniar Sash Horn Windows are a refined alternative to sliding sash windows, they perfectly capture the period style of a sliding sash window whilst maintaining the functionality of a casement window. This means that you get traditional looks, with a modern operation. This traditional aesthetic is captured by beautifully integrated horns; which are single pieces of uPVC that offer a better appearance than often obvious screw-on alternatives. All sash horn windows undergo stringent hand finishing for an unbeatable level of product quality. Featuring a high-security shootbolt from Yale, as well as superior weather sealing, all Liniar sash horn windows achieve fantastic levels of home security and thermal efficiency. Liniar French Casement Windows allow all homeowners to add a cultural element to their home. These windows effortlessly open up your property and offer many unique benefits. Get a wider view, with Liniar French Casement Windows. In order to achieve a completely unrestricted view, French casement window feature a flying mullion. This means that when opened fully, one sash carries mullion and leaves the opening free from any fixtures. The sashes present in French casement windows are able to be opened a full 90°, which allows for a greater feeling of space, and lets in more natural light. It also allows you to use these windows as a fire escape in all habitable rooms. Liniar French casement windows offer unbeatable levels of security, durability and thermal efficiency. They won’t let you down. Found your perfect uPVC Window? Don’t hesitate to find your local window installer or Liniar window supplier, and get the ball rolling on having them in your home! When you require exceptional quality combined with cutting-edge design, the Liniar uPVC door is the perfect solution. Manufactured to the highest standards and incorporating revolutionary technology, Liniar uPVC doors are market leaders. They offer a long-lasting and excellent performance, meaning that year after year, your double glazed door will keep its perfect condition and will never warp, rot or fade. Liniar offers a 10-year manufacturer’s guarantee which evidences the incredible quality of their double glazing. You can have confidence that your uPVC doors will stand the test of time. Liniar’s uPVC door profiles are flawless, offering a seamless fit with no draughts. Liniar’s uPVC door design is truly revolutionary. It has been designed from scratch, and outperforms traditional uPVC doors. Liniar double glazed doors use the latest technology resulting in products that are not only strong and secure, but energy efficient too. The Liniar design team continues to think outside the box, creating new products and enhancements and using 3D printing to test and assess their effectiveness. This commitment to developing new designs ensures that the Liniar double glazed door range is the most innovative and sought-after on the market. These amazing double glazed doors incorporate Liniar’s cutting edge and patented lead-free, multi-chambered profile, patented co-extruded bubble gasket in their profile. This ground-breaking technology enables Liniar’s uPVC doors to achieve the very highest energy efficiency ratings. Your home will be warm no matter how cold it is outside, and due to the minimisation of heat loss, your energy bills will be lowered, as you will require less heating. Designed to block draughts and to withstand even the harshest of weather conditions, the Liniar double glazed door will protect your home from the wind and rain. Using advanced technology, these impressive doors will ensure that you are kept safe and dry in all weathers. Liniar uPVC doors come in a range of designs for you to choose from, so no matter where in your home you want to install one of these fantastic double glazed doors, there is a style that will suit. You can choose from a range of glazing options including patterned or obscured glass, enabling you to achieve the look you want. Liniar uPVC doors are also available with a selection of colour finishes, including woodgrain, so your door can be personalised to suit your tastes. Whatever look you want from your new uPVC door, the full range of double glazed doors can be tailored to meet your requirements. The beautiful aesthetic of the Liniar French door is enhanced by its functionality. They offer a chic and elegant opening into your outside living space, and with a variety of thresholds, they can be truly accessible to all. With a Liniar stable door, you can have all the attractiveness of country styling with the practicality and additional safety of the two halves being able to open independently from each other. These gorgeous double glazed stable doors enable you to access ventilation while still keeping children and pets safe. Traditional patio doors were renowned for their lack of security and easy to break sliding mechanisms. This is no longer the case. Liniar double glazed patio doors have a revolutionary multi-wheeled ‘air glide’ system, offering outstanding performance and the Modlock™ system will keep your home safe and secure. Spectacular bi-fold doors offer a luxurious and expansive opening into your outside living space. Using all of Liniar’s revolutionary technology, these exceptional doors offer outstanding performance. As with all of Liniar’s double glazed doors, the bi-fold doors can be customised to suit your personal tastes. It’s not possible to buy the impressive Liniar double glazed door range direct from the manufacturer, however, Liniar supplies their uPVC doors to double glazing installers across the UK. No matter where you live, there will be a Liniar dealer near to you, and we provide a helpful search tool to find a local window fitter. Liniar only work with the very best tradespeople, and all of these double glazing installers are members of the Double Glazing Network, so you can be sure that they will offer an honest and professional service. Liniar uPVC French casement windows add an element of European charm to your home, as well as unfettered views. Manufactured in the UK, the Liniar uPVC French casement window is one of the most stylish windows that you can choose for your home. These beautiful double glazed windows incorporate all of Liniar’s market-leading innovation, making them a superior window option. The quality of the Liniar uPVC French casement window is unrivalled. You are able to count on their long-term performance too, as Liniar provide a 10-year manufacturer’s guarantee on these windows. It covers the superb, high-performance frame, giving you complete confidence. You will benefit from a flawless fit with your uPVC French casement window, resulting in no gaps or draughts. The Liniar French casement window was completely redesigned from scratch in 2007. Using the latest innovations and technology, the double glazed French casement window offers supreme performance combined with exceptional beauty. These delightful windows are energy efficient, secure and weatherproofed, protecting your home in a variety of ways. They have been created to offer a stylish and appealing appearance that hides their impressive capabilities. When you choose uPVC French casement windows from Liniar for your home improvements, you will benefit from a chic and streamlined appearance coupled with exceptional performance. The uPVC French casement window incorporates Liniar’s innovative multi-chambered technology to ensure that it offers superb energy efficiency. The revolutionary design means that these windows are in a class of their own when it comes to thermal performance. When the precision engineered profile is combined with standard double glazing, these uPVC windows are capable of achieving a Windows Energy Rating of A+. This outstanding level of energy efficiency means that your home will be warm no matter how cold it is outside. You can be confident that your home is protected when you choose a Liniar double glazed French casement window. These French windows are fitted with the high-security, multi-point locking from Yale as standard. The superior levels of security have been independently tested to the requirements of PAS:24 2012. Your family and home will be safe and secure when you choose Liniar uPVC French windows. The seamless fit of your uPVC French casement windows will ensure that there are no draughts or leaks from around the frame. The real beauty of these windows, however, lies in their exclusive Liniar technology. The Liniar French casement window incorporates a double-action bubble gasket which keeps your windows leak-free and completely weatherproof. It creates a continuous seal – even in the corners – so your home will be protected from the elements. When you choose Liniar uPVC French casement windows, they will provide you with more than just outstanding performance. You will receive a beautiful window that also offers a wide range of benefits. The Liniar uPVC casement window will give a stylish and appealing look to your home. Replacement double glazing is wonderful for refreshing the appearance of your property. One of the great design features of the Liniar uPVC French casement window is the floating central mullion. The superb design enables you to have unrestricted views when your windows are open, giving you a gorgeous outlook. Liniar uPVC windows come in a wide range of colours. You no longer have to stick with white uPVC if you don’t want to. Customise your uPVC French casement window so that it blends in with your home, creating a complementary look. Your uPVC French casement window has a variety of options available when it comes to the finish. Choose from internally or externally beaded, chamfered or sculptured frames with either 28mm double glazing or, for greater insulation, 36mm triple glazing. Your double glazed French casement window will be the perfect match for your home and your tastes. The installers in our network have been assessed to the very highest standards, in quality, service and price, so that you know you are getting a great double glazing company. Each one has achieved membership of the Double Glazing Network because they offer outstanding double glazing installations. If you would like to find your nearest installer, we have a search function to help find local double glazing fitters. You can find a company close to you who are approved Liniar double glazing installers, and who will provide you with a high-quality home improvement. Liniar uPVC French doors are a charming alternative to patio doors, providing plenty of light and a stylish entrance to your garden. The Liniar uPVC French door has been designed to incorporate all of Liniar’s innovative technology. It offers superb security, impressive energy efficiency and a wonderful aesthetic. These double glazed doors make a truly attractive alternative to PVCu patio doors or bi-folding doors, giving you a stylish and elegant entrance to your outside space. They offer versatility too, meaning that the uPVC French door is not only ideal for opening out into your garden, they can also open into your home from a balcony. This enables you to make the most of whatever outside space you have available. Liniar uPVC French doors offer a delightful appearance that will enhance your home, while still offering the high quality that you expect from Liniar double glazing. Liniar lead the way in double glazing design. Their state of the art innovations make their double glazing products achieve the highest standards and put Liniar at the peak of the industry. The uPVC French doors from Liniar incorporate their revolutionary multi-chambered design, making them market leaders when it comes to energy efficiency. These double glazed doors have also been created with security in mind. You can count on the very best possible quality when you choose Liniar uPVC French doors to enhance your home. You can choose from the standard 4 chambered uPVC profile or the EnergyPlus 6 chambered profile when creating your uPVC French door. These incredibly superior uPVC profiles, when coupled with high-quality double glazing, will provide and ultra-low U value of just 1.3 W/m²K. This ensures that your home will be quieter and warmer when you select Liniar uPVC French doors. Liniar uPVC French doors are designed to be highly secure. Fitted with the latest high-security locking mechanisms as standard, these doors achieve Secured by Design accreditation. This police preferred specification means that these doors have been tested against the most intense intruder techniques. You can be confident that your family and home are fully protected against break-ins when you choose a double glazed French door from Liniar. Liniar’s double glazed French doors feature innovative design features in the profile that ensure they are weatherproof. To confirm this, they have been rigorously tested in Liniar’s very own testing centre against the harshest conditions. You will be completely protected from the elements with your Liniar uPVC French door. Liniar uPVC French doors are engineered to offer beauty combined with performance. You have a variety of design options available to customise these double glazed doors so that they suit your home. These superb double glazed French doors are environmentally friendly and easy to maintain. They come with a 10-year frame guarantee, so you can be confident that they will never warp, rot, or fade. You can personalise the appearance of your uPVC French door with a wide range of delightful colour finishes. These double glazed doors can be enhanced with colours to create the perfect fit for your home. You also have a great variety of hardware options to choose from, enabling you to design a complete look that reflects your tastes. There are a variety of low thresholds you can choose from for your Liniar uPVC French Door. Perfect for wheelchairs, buggies and those with mobility difficulties, the Liniar double glazed French door can come with an ultra-low threshold and ramp. The Liniar threshold is uniquely designed to provide robust performance and to meet current Building Regulations requirements. Your Liniar uPVC French doors can either open in or open out, making them a great choice for a variety of spaces. Whether you live in an apartment and are looking for a stylish door to open up your balcony, or a large home, where you want a chic entrance to your garden, these doors are perfect. Our approved fitters will ensure that your double glazed French door is installed to the highest standards, giving you the maximum benefit. Our great search function allows you to find your nearest double glazing installer. Just enter your postcode, and you will be provided with a list of nearby double glazing installers. Our network of double glazing installers are all Liniar specialists, so you can count on their knowledge and experience. They will fit these exceptional uPVC French doors efficiently, to a high standard and with fantastic customer service.